If you’ve been reading my blog lately, you’ll notice I’ve submitted quite a few news releases lately. Press releases and news releases are similar and different. Press releases usually are for businesses that have come up with a new product of service and they want to tell the world about it. News releases are for sharing something newsworthy and are sent to organizations that distrbute the news, i.e. newspapers. Writing a news release isn’t rocket science, but the better it is, the more likely it will get ink. Some people think they can’t write one because they’re not reporters. Nonsense! You can and should write a news release whenever you do something big, small, or anything in between. For example, in the past week, I had three events concerning my latest thriller, The Brink: one was an evening with the authors event; two, I had a book signing at a quaint, independent bookstore; three, I did a presentation at the Alvarado Public Library on why writers need to think like entrepreneurs to get their books read. Fadden will be signing copies of The Brink at the Southlake Barnes & Noble book store on Saturday, Oct 9, from 1:00pm-3:00pm. To preview it, visit his website at www.markfadden.com. It is very important to include the first part about it being tagged for immediate release so the reporters/editors you are sending it to will know when they can send it out. Also, contact information right up front is critical. Newspaper people are on deadlines, don’t make them hunt to get information to contact you. Again, a high quality picture is a must. And I would try to keep it 500 words or less. And try to make it look like a normal newspaper article you see in your paper. Again, deadlines are the reason why here. The less work a reporter/editor has to put into your article, the more likely it will get ink. Hope that helps. Comments? Question? To the comments! P.S. You ‘ll see that I changed the title of my blog yet again. I went to an SEO (search engine optimization) seminar today and oh my dear lord, what a mountain of information! We’ll be covering that topic tomorrow night. Not only is Fadden a freelance writer and he continues to work on new novels, he is also currently on a book tour promoting his latest award-winning thriller, The Brink. In the book, a fugitive cop helps a woman running for her life only to get sucked into a secret society’s plot for global financial Armageddon. Fadden uses many social media platforms like Facebook, Twitter and his blog to spread the word about his books. However, he will be the first to say that when it comes to making fans, it’s still face to face meetings that work best. The Brink has won its publisher’s Editor’s Choice Award and the Rising Star Award. Not only does Fadden have several signings scheduled at book stores in the Dallas/Fort-Worth, Texas area this fall, readers can preview the book and even get a signed copy at http://www.markfadden.com. Fadden’s blog, The Campaign: dispatches from the literary trenches, can be viewed at https://markfadden.wordpress.com/. Copies of Fadden’s “Get Your Book Read” PowerPoint presentation are available for free. Simply email him at mark@markfadden.com for a copy. Cooler temperatures make a lot of people want to curl up with a good book. 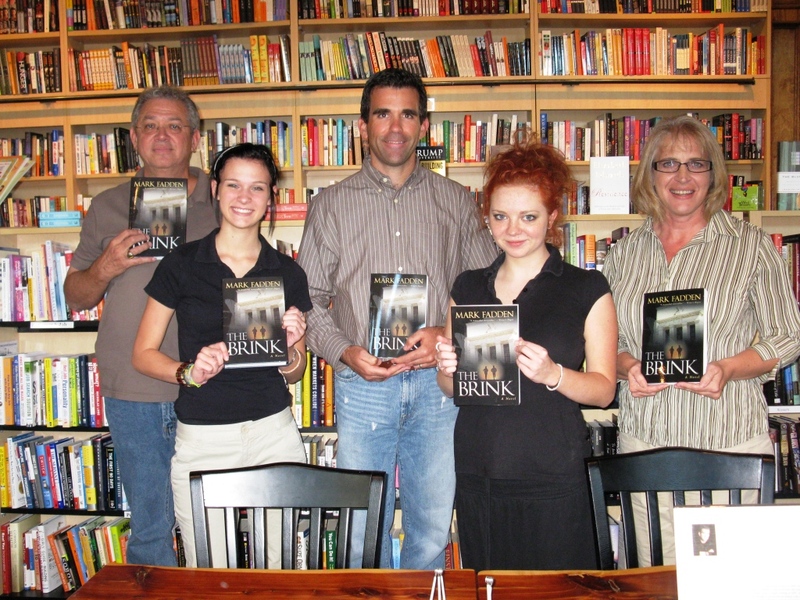 And that’s exactly what customers got a chance to do at The Book Carriage & Coffee Shop in Roanoke on Sunday when Colleyville author Mark Fadden stopped by to promote and sign copies of his latest award-winning thriller, The Brink. In the book, Fadden incorporates a lost article of the U.S. Constitution into the story of a fugitive cop that helps a woman running for her life, only to get sucked into a secret society’s plot for global financial Armageddon. The Book Carriage & Coffee Shop is an independent general bookstore/coffee shop located at 304 North Oak Street in Historic Downtown Roanoke. 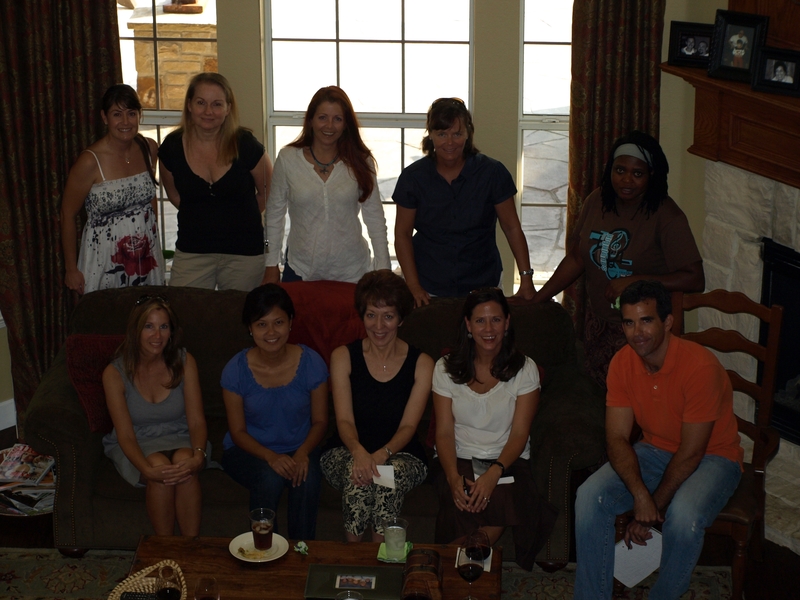 Contact them at info@bookcarriage.com or 817.491.2858. Or visit their website at www.bookcarriage.com. Mark Fadden can be reached at mark@markfadden.com. He has several upcoming signings in the DFW area and is available to attend book club reviews as well. He is also giving workshops on how authors can use social media to sell their books at various local libraries. Visit www.markfadden.com to view his schedule of events or to preview The Brink. 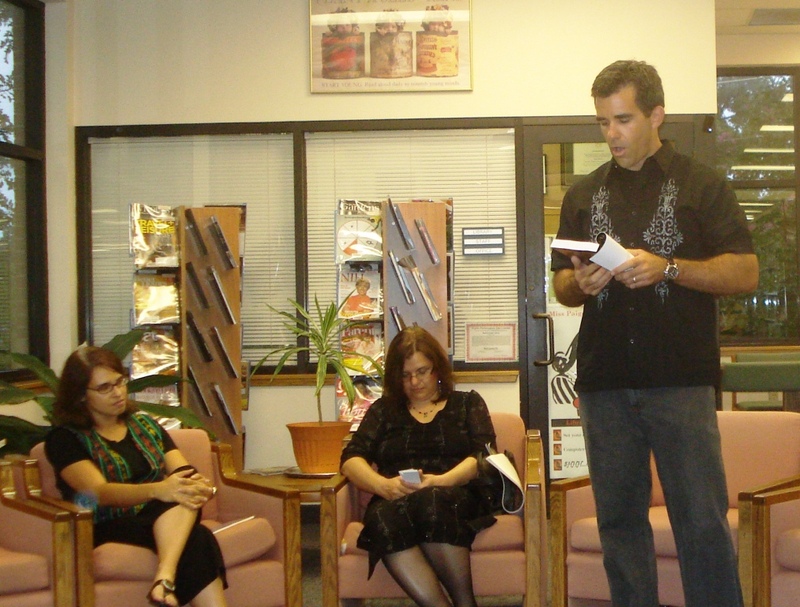 Poet Rebecca Balcárcel and author Sarah A. Hoyt listen as author Mark Fadden reads from his latest thriller, The Brink." As one of the last events at the Bedford Public Library’s current home before it moves to its new location, the Friends of the Bedford Public Library hosted, “An Evening with the Authors” on Saturday, Sept 25. “Where do you get your inspiration for your stories?” “How did you get started writing?” “How long does it take you to write your books?” were just some of the questions fielded by Colleyville thriller author Mark Fadden, local poet Rebecca Balcárcel and author Sarah A. Hoyt, who writes science fiction, fantasy and mysteries. Not only did the authors share stories about their experiences with publishers, their writing processes, and current writing projects, but all three read from their most recent works and signed copies of their books. “I absolutely love coming to these events,” said Fadden, who was the only first-timer at the event. “It’s great to talk to people about the journey of a story going from an idea in your head to a finished, published novel.” Fadden read from his latest novel, The Brink, which was recently published in May 2010 and has already won several awards. In it, a fugitive cop helps out a woman running for her life, only to get sucked into a secret society’s plan for global financial Armageddon. Sarah A. Hoyt, who traveled all the way from Colorado Springs, Colorado and has published 17 books, read from her latest book, Dipped, Stripped, and Dead. Besides attending the event, she hosted a writer’s workshop over the weekend at the library where she discussed story structure, how to market and the realities of being a writer. 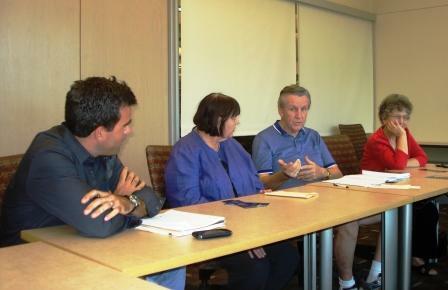 “I made every mistake in the book, so I am very qualified to teach this workshop,” said Hoyt. All three authors have websites. For more information, visit www.markfadden.com, www.rebeccabalcarcel.com or www.sarahahoyt.com. “The only constant is change.” – I forgot who said this. If you been following this blog, you’ll see that I’ve made some changes to better reflect what this blog is all about. I hope these changes will draw some more folks into the fold so that we can have a more lively discussion about what’s working and not working in the book marketing world. Word of Mouth Marketing (WOMM) – is old school still the way to go? What is WOMM? Let’s say a friend of yours tells you about a new book. “I just read The Brink by Mark Fadden and it was awesome. It was so suspenseful and fast, I found myself reading as fast I could to keep up with the action. There’s also this part about a lost Constitution article, and there’s tons of Federal Reserve history and a secret society called the Bilderberg Group that I never knew about. You’ve got to read it!” We all have had that conversation, right? And we all have purchased something based upon that friend’s recommendation, right? The Brink is Fadden’s third novel and has won both his publisher’s Editor’s Choice and Rising Star Awards. He will be signing copies at the Lewisville Barnes & Noble book store on Sunday, Oct 10, from 2:00pm-4:00pm. His first novel, Five Days in Dallas, was published in 2003. It received critical acclaim and Fadden himself was even called a “masterful storyteller” by a Writer’s Digest reviewer. To preview The Brink, view his event schedule or read his blog about writing novels and book marketing using social media, visit http://www.markfadden.com.